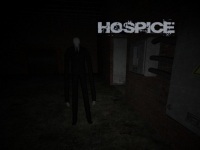 Hospice is the second series/map in the Slenderman's Shadow game. Your objective is to collect 8 pieces of white paper on the wall, each contains 2 lines of poem. If all lines are collected, they will become a poem telling story about 'Der Grossmann' which means 'The Tall Man' or Slenderman. Your horror adventure takes place in an old abandoned hospice. This series is more similar to the first one, Sanatorium. However, there are some additional features such as the use of glowstick to mark a room that you have been in before. Slender will always shadow your steps. He will drain your sanity if he can look directly into your eyes. If you happen to see the Slenderman, just turn away quickly from him and run away to continue collecting other pages. Explore a house invaded by imps, horrible gremlin-like creatures.